CreatureCantina.com: These are the Droids you are looking for! PSWCS.org has received a donation of a limited number of our 2016 "Pets for U.S. Vets" fundraiser medallion. These are medallions that were purchased last year, and the full value of the donation has already been donated to the charity. In a special one-time offering, we are including a free 2016 medallion along with each 2017 "No Warrior Without Help" medallion purchased. This offer does not apply to medallions purchased through our $23.99 2018+2017 two-pack promotion. It only applies to BB-8 medallions purchased at the $15 price point. The number of free 2016 medallions is extremely limited, and the offer expires once all are given away. 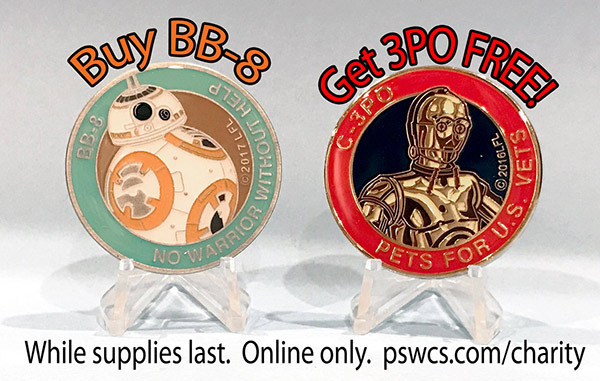 The Pennsylvania Star Wars Collecting Society (PSWCS) and No Warrior without Help have teamed up to offer their remaining BB-8 charity medallions with this special BOGO offer. The BB-8 coins originally debuted at Star Wars Celebration 2017 in Orlando, FL and are now exclusively available online. Each medallion is $15 shipped in the US (international shipping available) and all proceeds benefit No Warrior without Help. With each purchase of a BB-8 coin you will also receive a free C-3P0 coin. No Warrior without Help, based in Central Pennsylvania, is a 501(c)(3) non-profit organization that provides direct financial support to assist wounded veterans as well as train service dogs. Both limited edition medallions are fully approved by Lucasfilm and have an edition size of 1000 pieces. Each 2017 medallion features the likeness of BB-8 on the front, along with the date and the name of the charity, No Warrior without Help. The back features the PSWCS logo. Each 2016 medallion features the likeness of C-3P0 on the front, along with the date and the name of the charity, Pets for US Vets. The back features the PSWCS logo.